A ko is called an approach ko if a player must make one or more approach moves in order to convert it into a direct ko; to win they must therefore ignore two or more ko threats. Black and White are involved in a ko fight at ↔ a. If Black ignores one ko threat, he can end the ko and win the fight by capturing seven white stones. White, on the other hand, can not end it immediately. First she will have to ignore a threat to fill up a liberty at b (or c, but b is better). Black re-takes, and the ko will then be fought out the normal way. 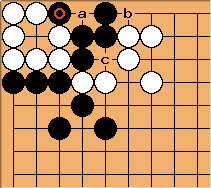 Thus, White has to ignore two threats to capture the four black stones. The example above is a one-move approach ko. Going on, if Black had even more liberties we could also get a two-move approach ko, a three-move approach ko, and so on. The term x-ko for x-move approach ko has also been proposed: see there and the /discussion sub-page. It is important to distinguish this type of ko from a ten-thousand-year ko, which also involves a kind of approach move. Having to make extra moves means one must ignore two or more ko threats in order to win the fight, making it roughly twice as expensive; the details depend on the value of the threats and on whether finishing the ko is sente or gote. It also means that one must find more threats while one’s opponent gets to retake the ko without a threat. A three-move approach ko is no ko. Multi-stage ko (page aliases: Two-stage ko, three-stage ko) — a ko where fighting can move back and forth between adjacent ko mouths. The Japanese term for it is yose-ko; here yose indicates approach, not endgame. Robert Pauli: Instead of talking about a two-move approach ko, which does not say who has an advantage, I prefer to talk about a ko where, say, White owes two approaches. E.g. rather than "White will have to play at b" I would say "White owes an approach at b". If they fight a needs-one ko she owes the move, and he runs out of ko threats while she possesses exactly one, he'd be glad to find a needs-one ko threat. a potential ko that needs one move to become real. Robert Pauli: Well, you could as well say that Black has a ko threat for free . . . wrong. A free move enabled by a to-be-done approach gains points, a free threat does not, it only allows the retake. Robert Pauli: She might simply lose too much, as explained in the footnote above.